From choosing what soap to buy, to whom you go out with. . . . the decisions you make are controlled by a combination of logic and emotion. That sounds simple enough, but every time you resolve to do or not do something, your brain is deliberating a multitude of factors at lightning speed. Welcome to the Innercise on logic vs emotion! 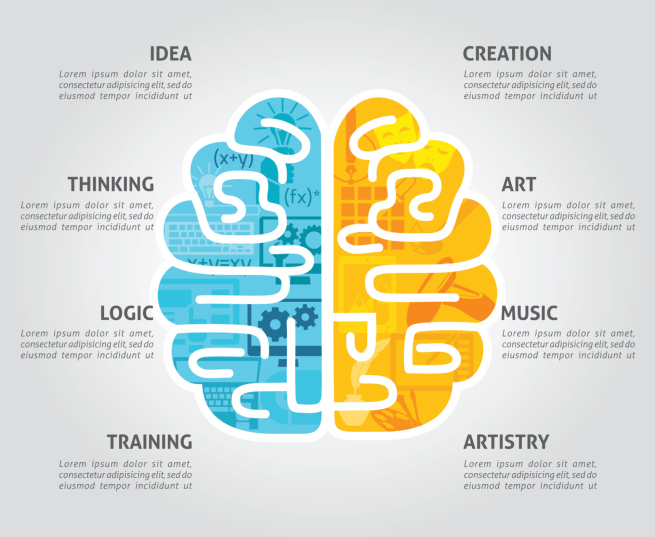 Here's where we use proven psychology and the latest advancements in neuroscience to help motivate you to put your ideas into action and, with practice, keep your left and right brain active and balanced. Understanding how the decision-making process works is essential to preventing poor choices in the future. To make an important decision it is best to actually use both sides of your brain. . . . not just your logical, left side. Ideas and the decision-making process starts in your left prefrontal cortex. . . and if there isn’t enough emotion behind the vision, then the part of your brain called the nucleus accumbens (NAc) is not activated. And if the NAc isn't activated, dopamine, which regulates movement and emotional responses, won't be released into your body. . . . and so you most likely won’t expend any energy on the idea, decision, or goal. When you have a clear goal or idea and you are emotionally stimulated by it, you're also activating the motor cortex of your brain, which helps you figure out what to do and how to do it. The tug of war between logic and emotion is as ancient as the human species itself. It’s what separates us from other mammals. Animals are focused on only what they need. Food. Shelter. Reproduction. We get to decide what we need and what we want. Pizza or salad? Condo or mansion? MMA fighter or accountant? And yet, with our big, "evolved" brains that puts us at the top of the food chain, why do we make so many poor choices? It's said that about 80% of the decisions we make are driven by emotion instead of rational thinking. From car shopping to having "one more drink," what we feel often has far greater influence than what the practical voice in our head is telling us. It references a state of mind everyone faces daily. If you are feeling one (or a combination) of these and face a decision big or small, you are much more susceptible to making an emotional decision, even if it is the wrong one. We call this Innercise, "Finding Balance." It will help you to get in tune with both sides of your brain. It'll also help to reduce anxiety and reduce any stress that's living inside your brain and body. Try this Innercise to find the balance between the left and right brain, which will help you make good decisions and accomplish your goals. 1. Assess whether or not you are feeling HALT. If you are, take care of your needs. And when you feel calm and relaxed, state the decision or goal you need to carry out and write them down. This primes a healthy mindset. 2. Practice alternate nostril breathing. Alternate nostril breathing optimizes both sides of your brain so you can access your whole brain and all the benefits that go with it. Here's how you do it. Use your right thumb to close off your right nostril, inhale slowly through the left nostril, pause for a second, now close left nostril with ring finger and release thumb off right nostril. Exhale through your right nostril then inhale through the right nostril. Pause. Use your thumb to close off right nostril. Breathe out through left nostril. This is one round. Start slowly with 1 or 2 rounds and gradually increase. 3. Sit quietly in meditation for a few moments after you have finished. 4. When you're ready, take out the piece of paper and write down your decision and a clear action step toward your goal. After you try this Innercise, please let us know how it worked for you or share one of your reasons why you must achieve your goal in the comments below. And share this terrific, scientific information with your friends on social media. Are you ready to make the right decisions and get from where you are now to where you want to be? Join John Assaraf and Dr. Sarah McKay for a 60-minute masterclass to help you recognize and release any of the mental or emotional obstacles that are keeping you from reaching your full potential.